Multiple Sclerosis can potentially be a debilitating condition, but fortunately, the new AlterG-anti gravity treadmill can benefit people who have MS. 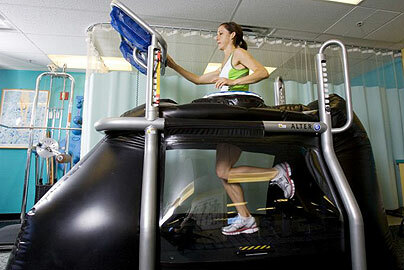 The AlterG anti-gravity treadmill was developed in 2006. It was originally designed to help astronauts simulate walking on the moon. This special anti-gravity treadmill helps take the stress off of the body while the person is walking or running. In fact, the AlterG anti-gravity treadmill allows people to run using only 20 percent of their bodyweight. Val Dellocono, who is a physical therapist at Trinity Rehab, had the following to say about this new treadmill, “The AlterG is definitely on the cutting edge of technology in physical therapy.” Physical therapy is frequently prescribed to MS patients because it can help them reduce their pain and improve their mobility. Even though MS has no cure YET, doctors believe that the AlterG anti-gravity treadmill can make it easier for patients to cope with their illness. Tim Loftus, who is a 49 year-old author and technology consultant, is one of the few MS patients who has had the privilege of trying out the new treadmill. He has to use crutches and a walker to get around, but he stated that he was able to walk on the treadmill without feeling tired. Loftus stated that he is hoping that other MS patients will have a more positive outlook about their condition. The AlterG anti-gravity treadmill costs anywhere from $30,000 to $70,000 and is only available in a few medical facilities. However, it is likely that more clinics and hospitals will invest in this treadmill. Good information. Costs of such devices make it unlikely that many who could or would benefit from them will have access to them. Yet, it is good to know that such devices exist. Thank you for this information. I'm a 70 yr old female diagnosed with MS over 30 yrs ago. I have been cane dependent for over 15 years and require a scooter for long distances. I've been walking on the Alter G for approximately 8 months. I'm thrilled with the improvement in my walking on and off of the machine. I have slowly progressed to walking for 25 minutes on the Alter G at 40% of my body weight. My biggest thrill is how much better and farther I'm walking with my cane. Additionally my legs are stronger and I have not fallen for several months. I'm actually able to walk a few steps without my cane which is a monumental accomplishment for me.